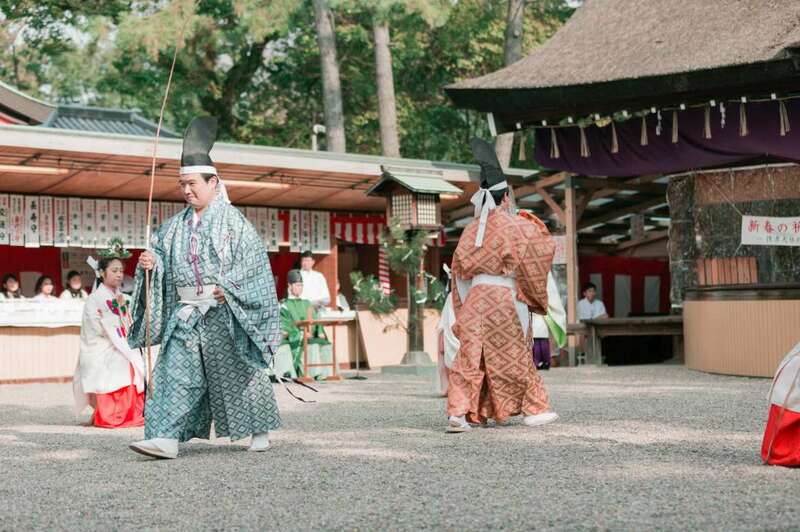 The Toka Shinto Service is one of Sumiyoshi Taisha’s special ceremonies. 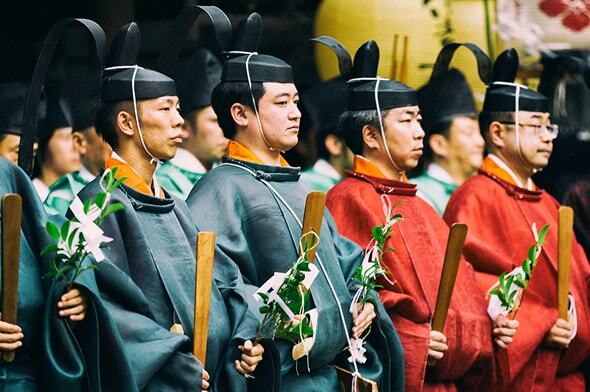 Shinto priests disguised as Fuku-no-kami (the gods of fortune) ring in the New Year with an offering of mochi (sticky rice cakes) before the gods. 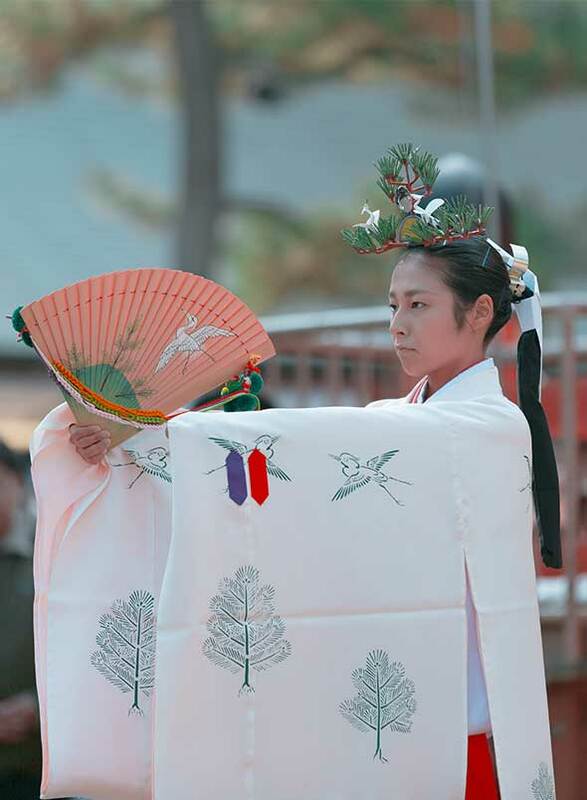 Following this, female kagura performers lead the Shirabyoshi and Kumano dances while mochi are handed out to guests. 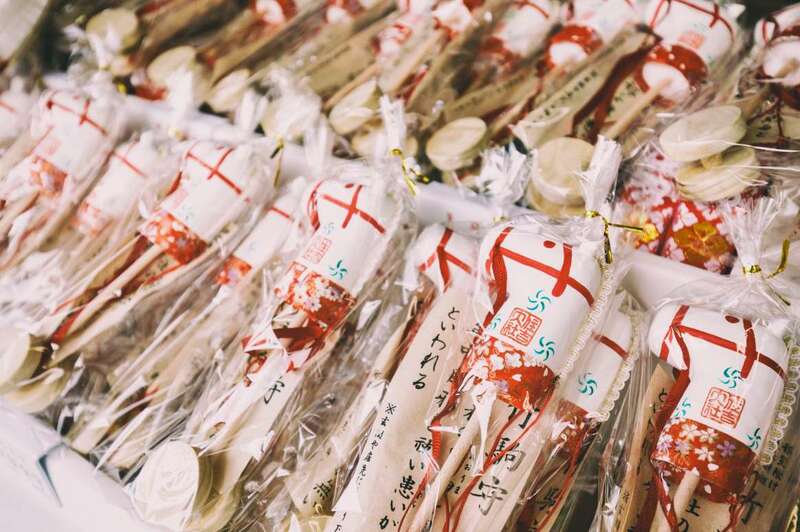 The shrine comes alive with worshippers as this “Fuku-no-mochi” are said to bring happiness in the coming year to all who receive them. 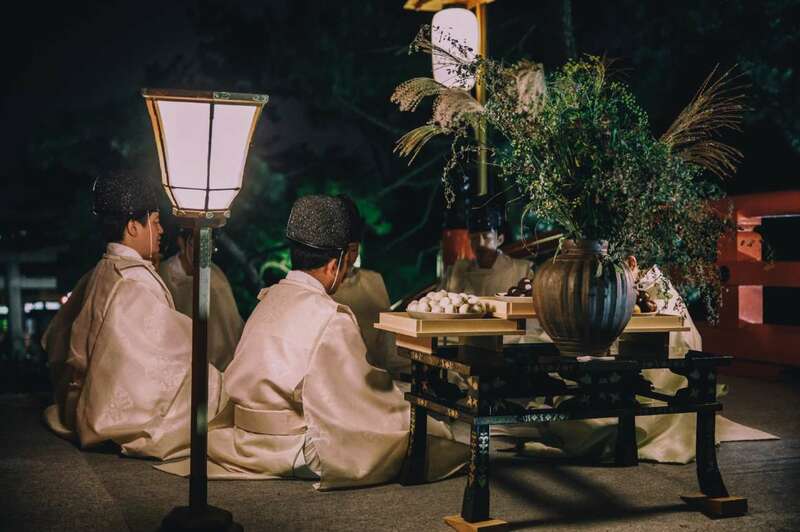 In the past, the Toka Shinto Ritual was performed at the royal court for the new year and has been passed down to become one of our shrine’s unique services. 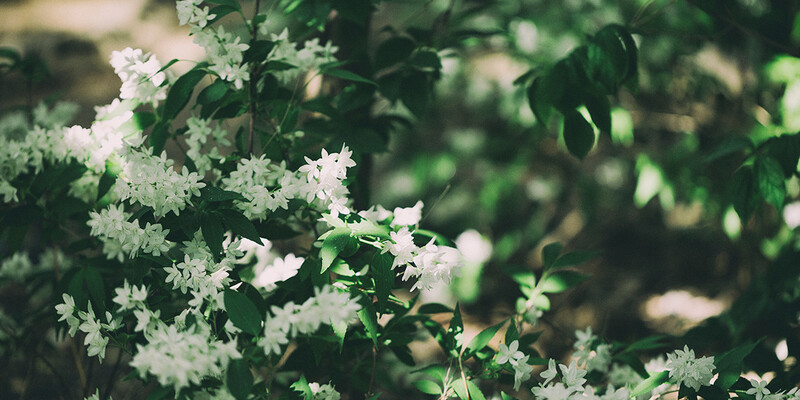 Carrying young plum tree branches, the god Ebisu calls out “Fukuromochi”. Hearing this, the god Daikoku, with a sack of small rice cakes in hand, replies “O-tomoyo” as they slowly approach each other. 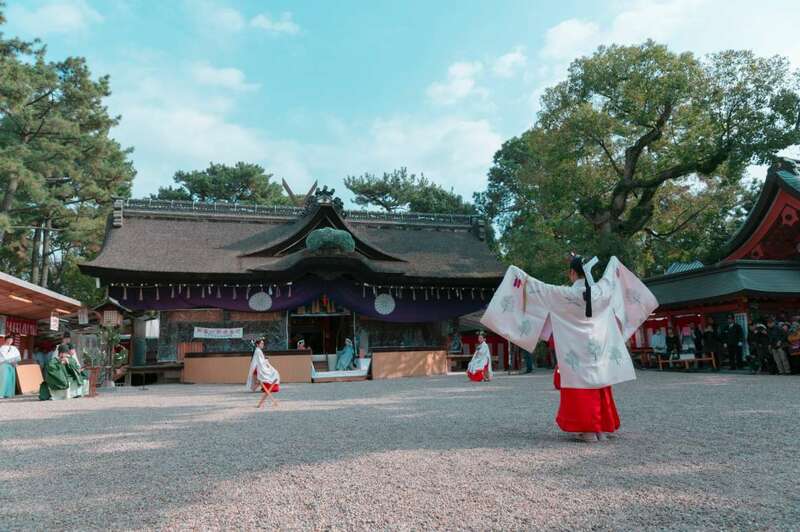 Following this, Daikoku offers the small rice cakes at the shrine to the tune of “Hi-Fu-Mi-Yogoto” and finishes with 3 chants of “Manzairaku”. 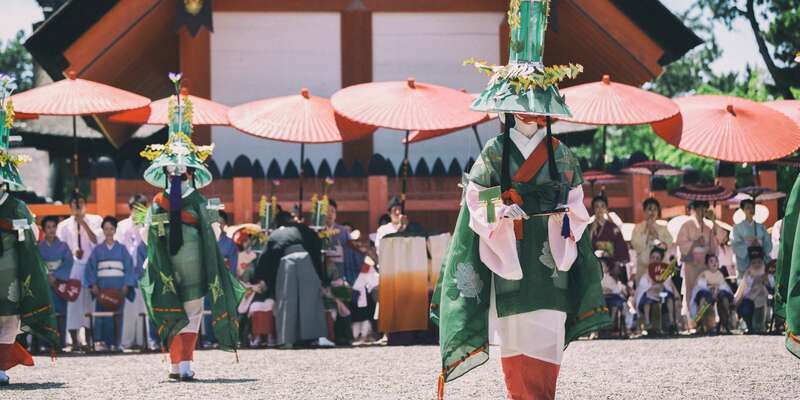 Next, Shirabyoshi and Kumano dances are performed by female kagura dancers, and a service for handing out rice cakes is held after the ritual. 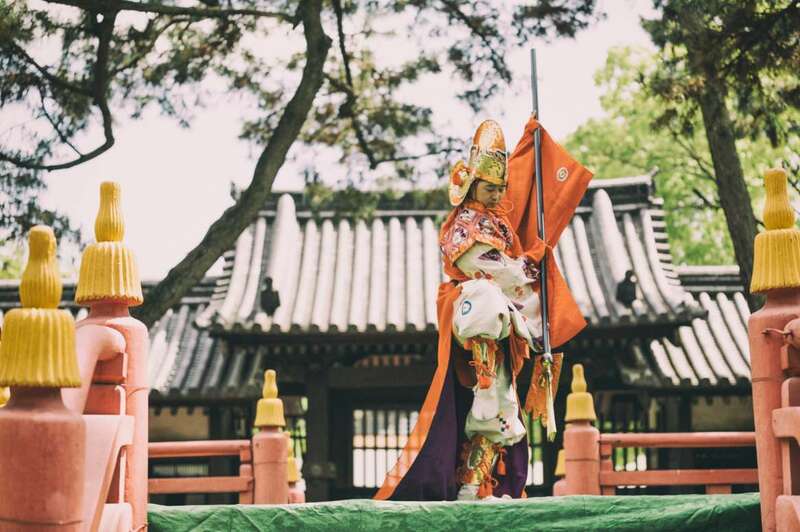 As this “Fuku-no-mochi” is believed to bring happiness, our shrine comes alive with a large number of visitors each year. 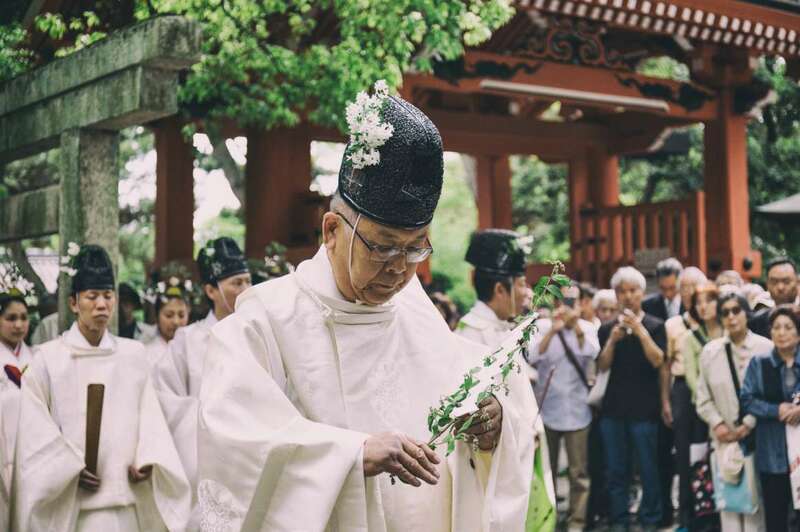 The Aouma Shinto Service is one of our shrine's unique rituals. 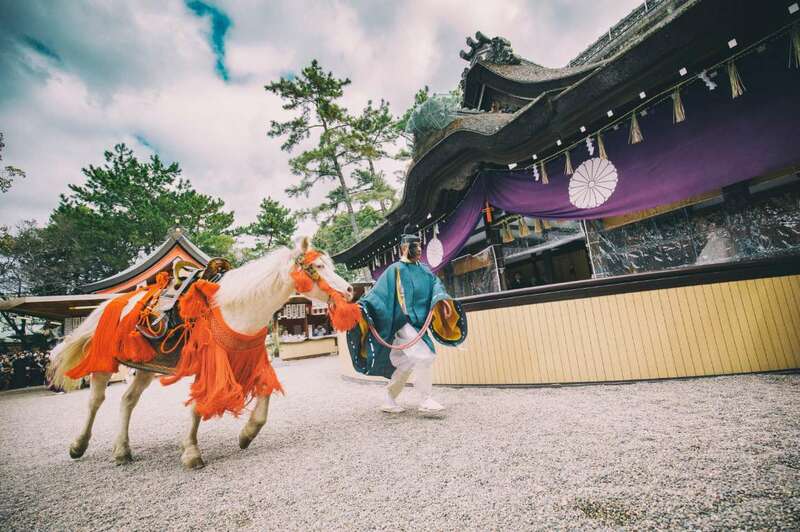 After visiting each of the main shrines, the sacred horse of the current Shirayuki Line runs around the shrine grounds. It is said that those who see the auspicious white horse during the New Year's celebrations will remain free of illness in the following year. 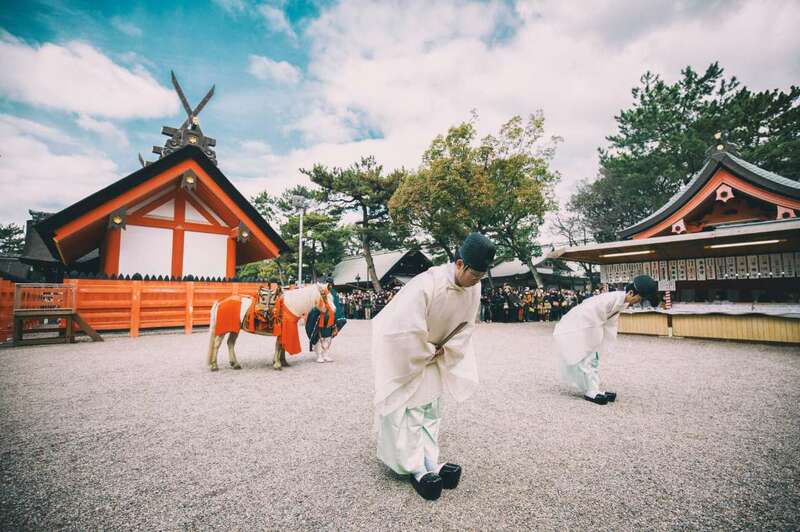 The Unoha Shinto Service is a ceremony commemorating the founding of Sumiyoshi Taisha. 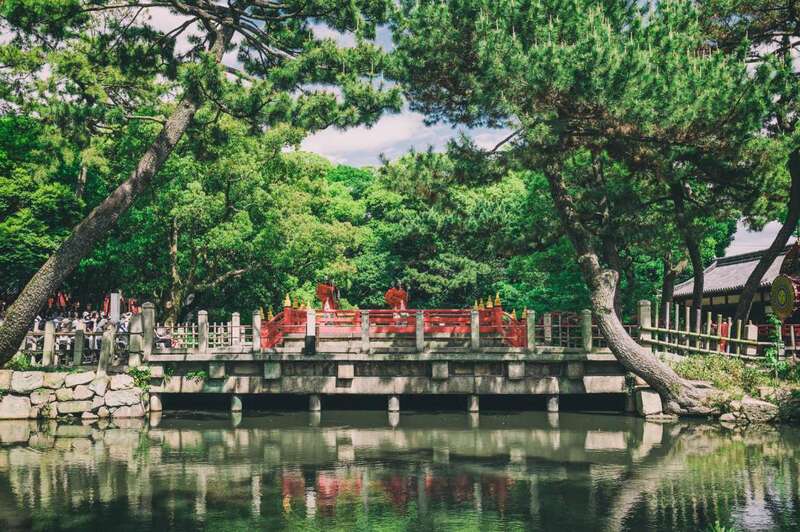 Sumiyoshi Taisha was enshrined in 211 and has a history of over 1800 years. 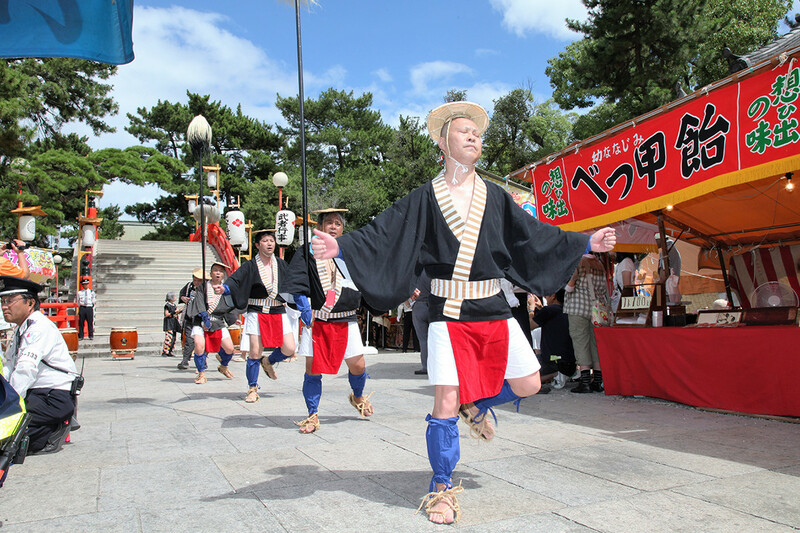 On this day, tamagushi sacred branches specially made from unoha are offered with a special song and dance performed at the festival’s end. 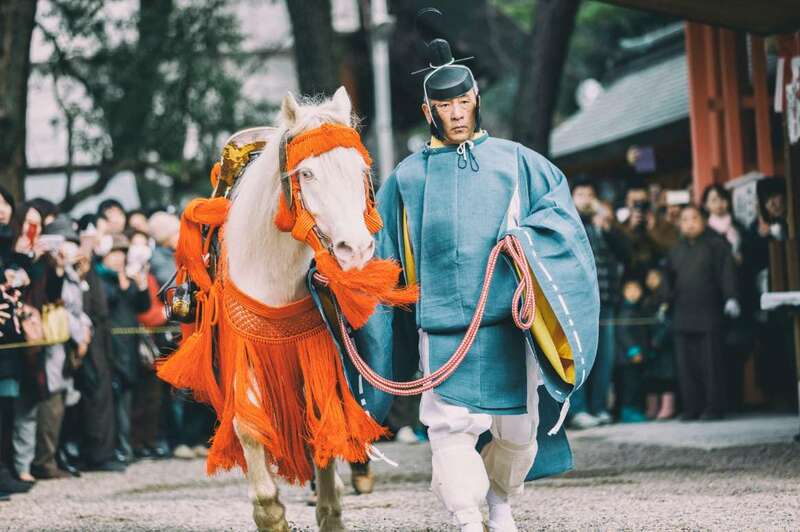 The Otaue Shinto Service is a ceremony for abundant harvests that has been designated as an Important Intangible Folk Cultural Property of Japan. 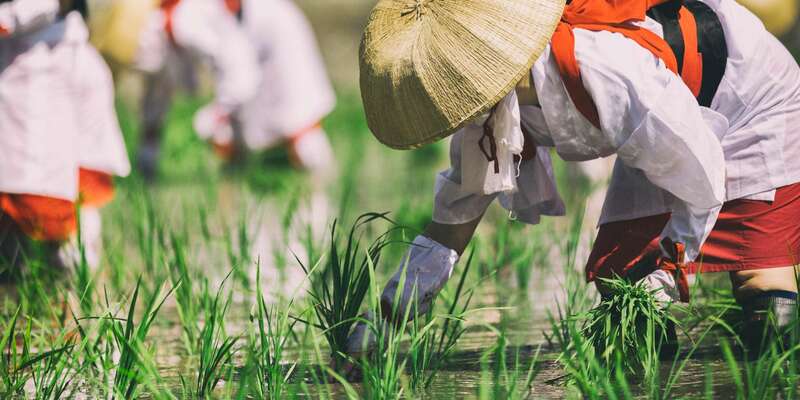 Rice seedlings handed down from the gods are carefully planted one by one. 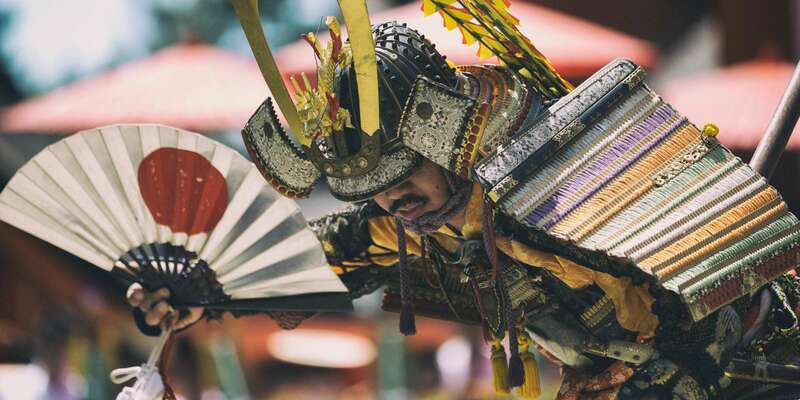 In the center of the rice field stage, female Kagurame dancers perform "Yaotomemai" (literally, "a dance by eight maidens"), while other performers dressed in armor carry out samurai rituals. 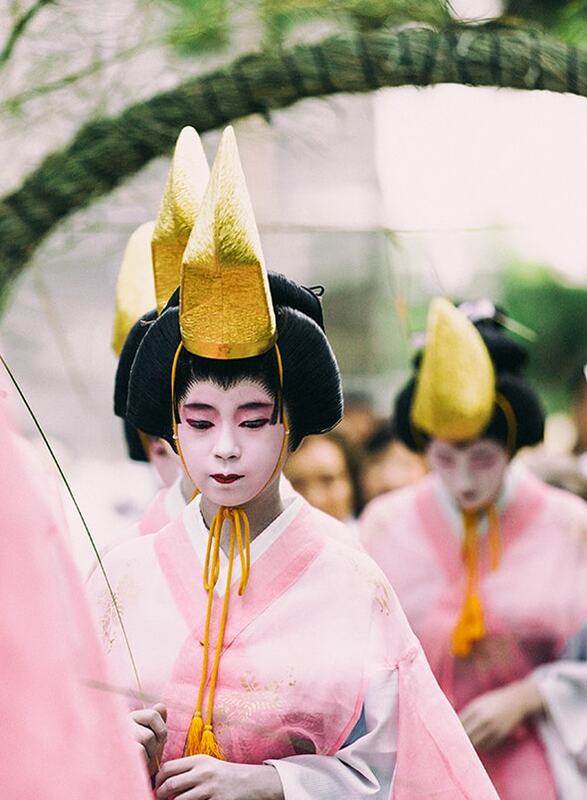 Following this, local children deliver a rice-planting dance, and the event is finished with the Sumiyoshi-odori, a dance timed with the completion of the rice field's planting. 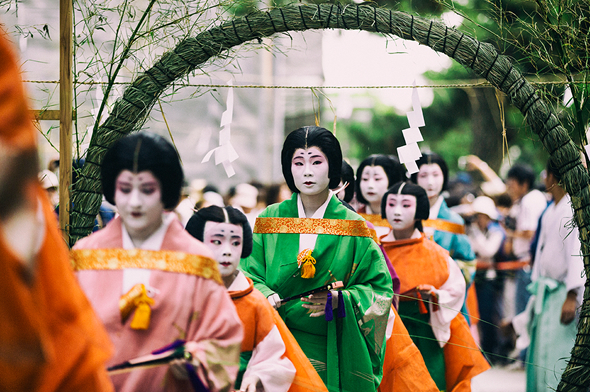 Sumiyoshi Matsuri is the most important Shinto ritual of the year. 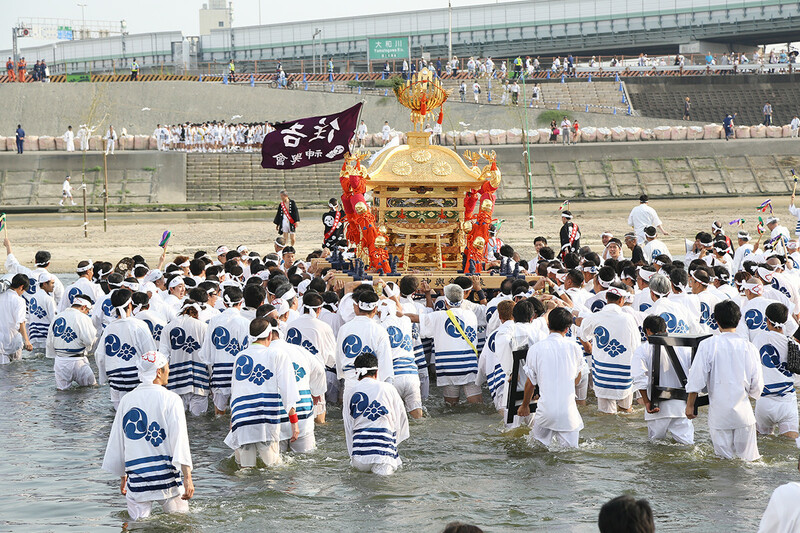 The festival begins with the Mikoshi (portable shrine) Washing Ceremony on Marine Day and lasts for 3 days from July 30th to August 1st each year. 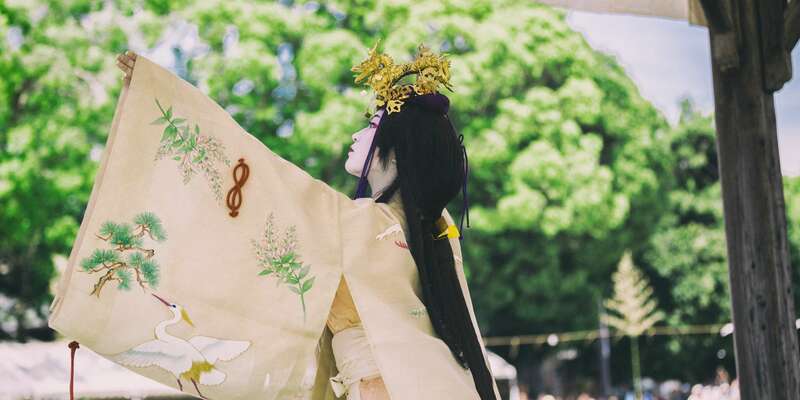 Carrying the meaning of ‘O-Kiyome’ or the ‘purification’ of Osaka, Sumiyoshi Matsuri was also locally known as ‘Oharai’ from long ago. 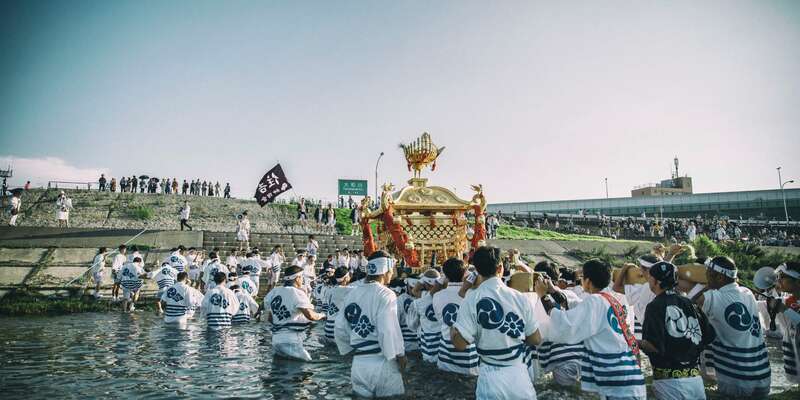 This ritual is held to transfer the gods of Sumiyoshi to the Mikoshi portable shrines ahead of the Mikoshi Togyo ceremony held on August 1st. 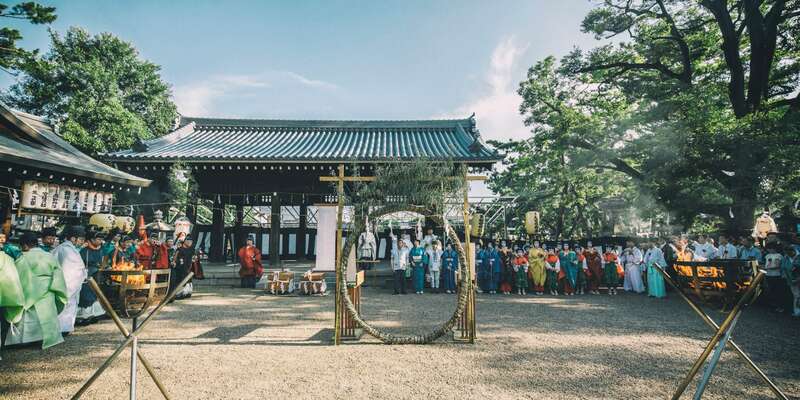 Starting from this day, the shrine grounds are lined with food stalls and shops and filled with lively worshippers. 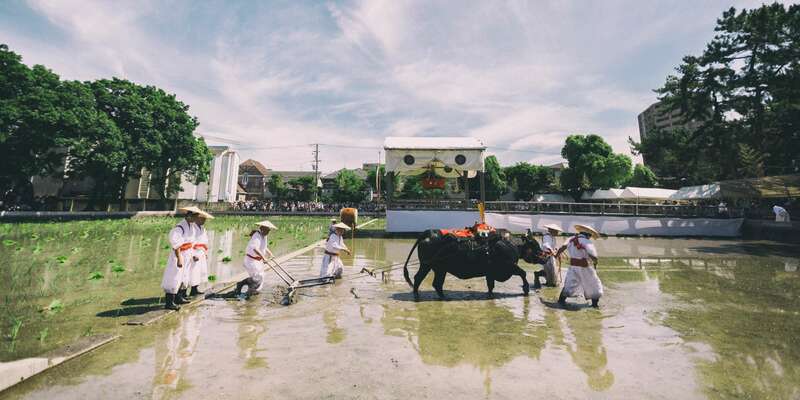 This ritual is held immediately before the annual festival and features three cogon grass rings which visitors pass through to purify both body and mind. 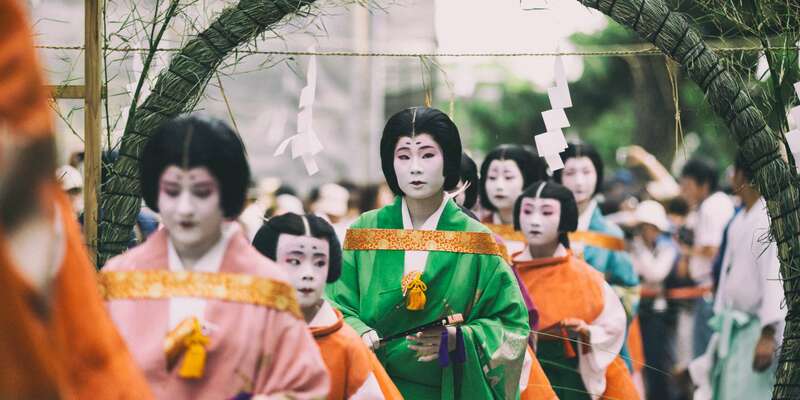 In a scene reminiscent of a period painting, some of the procession highlights are the gakujin musicians, chigo children, kanabo metal rods, and nagoshime maidens dressed as travelers. 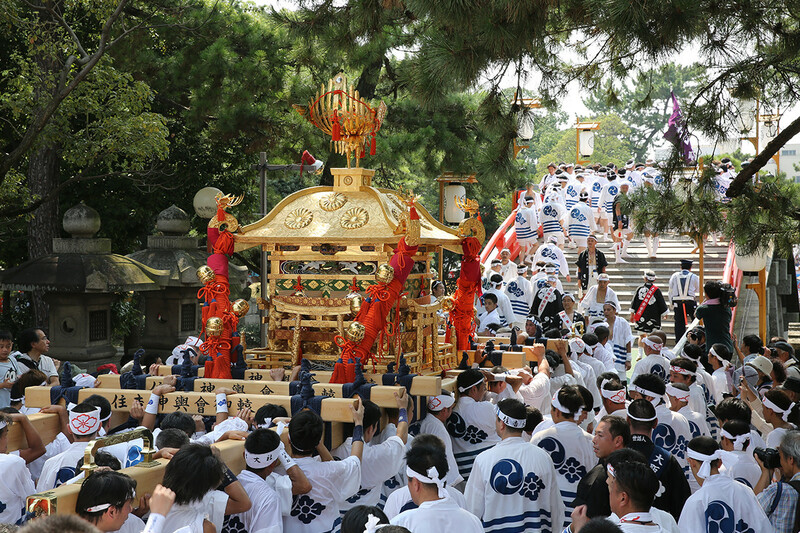 Mikoshi Togyo is a Shinto Service centering on the Mikoshi portable shrine that carries Sumiyoshi's gods. 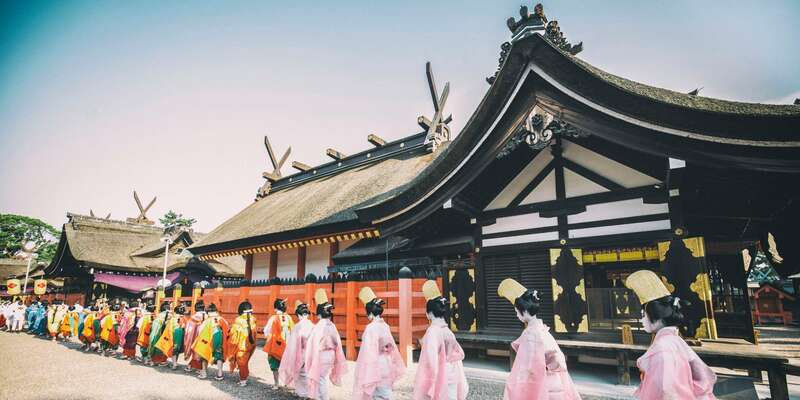 It consists of a procession of around 1000 persons who travel to Shukuin Tongu in Sakai together with the shrine. 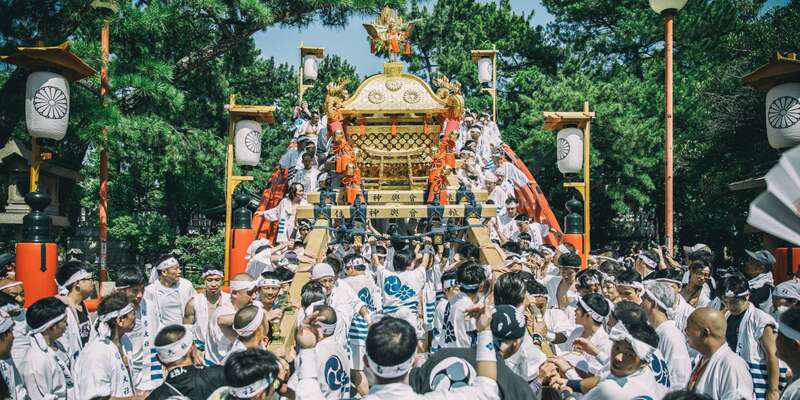 Awestruck spectators warmly welcome the Mikoshi's arrival and pray to the gods of Sumiyoshi for blessings in the coming year. 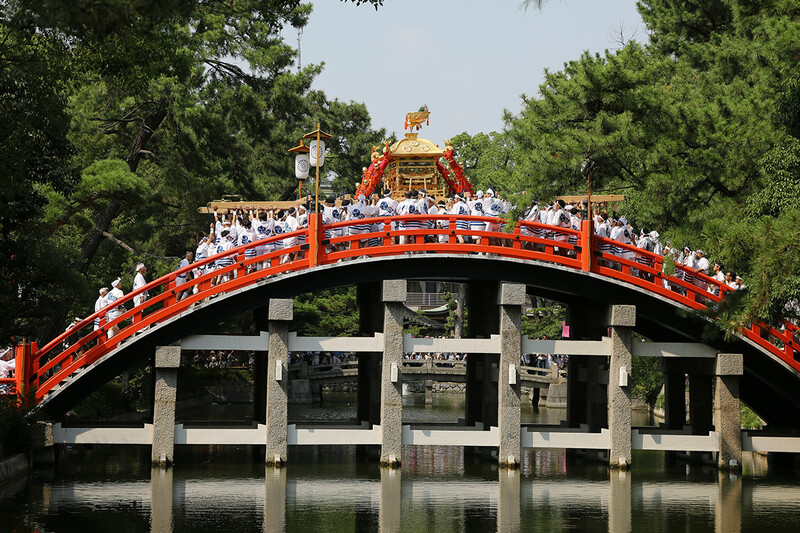 The Full Moon Festival is one of Sumiyoshi Taisha's unique Shinto Services and is held on the day of the Harvest Moon. 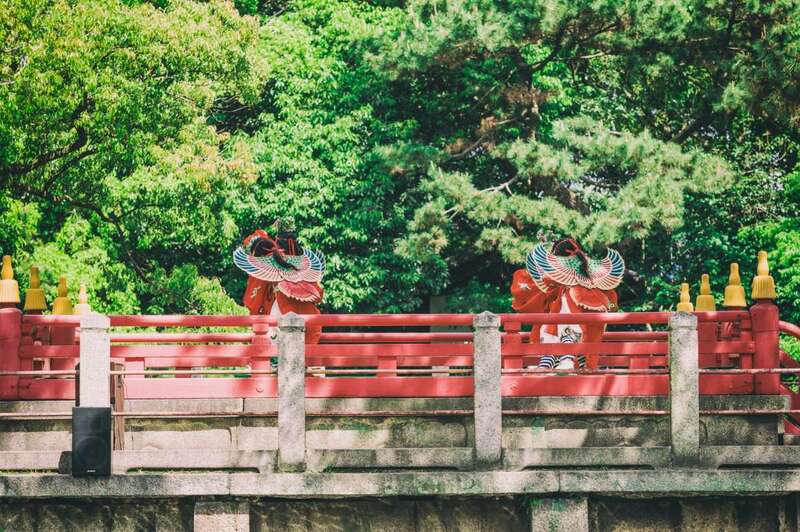 As the moon rises, a Shinto priest stands on the arched bridge and introduces poems selected from around Japan in the style of Reizei. 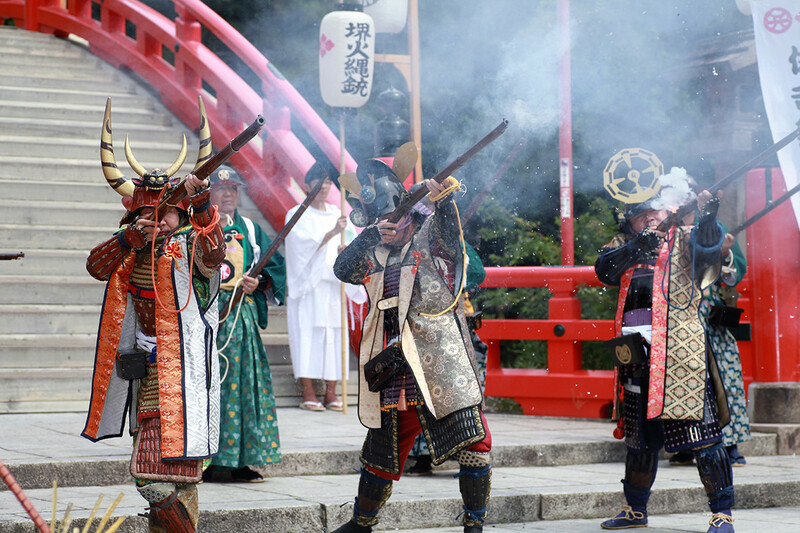 After this, a Sumiyoshi song and dance is offered from atop the bridge.